Automotive seat belt height adjuster is an equipment of the seat belt system in automobiles, which adjusts the shoulder height of the seat belt. It is present mostly for the driver and the front passenger seat of the vehicle. Automotive seat belt height adjuster assembly systems are mounted on a vehicle B-pillar to attach the D-ring belt anchorage. The height adjuster assembly can be moved vertically to optimally locate the seat belt and D-ring. Automotive seat belt height adjusters are usually found in hatchbacks, sedans, SUVs, compact SUVs, crossovers, MPVS, and light pickup carrier trucks. Increasing production and sales of passenger cars supplemented with rising demand for safety and comfort while driving are key factors that are anticipated to augment the automotive seat belt height adjuster market during the forecast period. The automotive seat belt height adjuster offers maximum comfort, convenience, and safety to both front seats via adjustment of the height of the shoulder belt anchor. Moreover, it prevents the seat belt from rubbing against the driver’s or front passenger’s neck. This factor is likely to boost the demand for automotive seat belt height adjuster during the forecast period. Additionally, stringent government policies owing to safety concerns about utilization of seat belts while driving are anticipated to boost the automotive seat belt height adjuster market during the forecast period. Automotive seat belt height adjuster offers several benefits; however, the market faces a couple of limitations. The electrically operated seat belt height adjuster consists of sensors and other mechatronic components for automatic operation of seat belts in the vehicle. This leads to higher maintenance and replacement cost of the electrical operated seat belt height adjuster in the event of malfunction. On the other hand, manually operated seat belt height adjuster requires physical intervention, adjusting the shoulder height of the vehicle, which is a bit cumbersome activity. These factors are likely to hinder the demand for seat belt height adjuster among consumers. The global automotive seat belt height adjuster market has been segmented based on technology, seat, vehicle, and region. Based on technology, the automotive seat belt height adjuster market can be segregated into manual and automatic. Automatic is a highly attractive segment of the automotive seat belt height adjuster market. This is primarily due to a surge in the demand from consumers to opt for highly advanced safety and comfort features in vehicles, as these seat belts adjust their height electronically. In terms of seat, the global automotive seat belt height adjuster market has been split into front and rear. The front segment leads the global automotive seat belt height adjuster market. Majority of vehicles are equipped with front seat belt height adjuster, as the impact of collision on the front seats is comparatively higher and improper adjustment of the seat belt may result in severe injuries. This, in turn, has prompted manufacturers to incorporate seat belt height adjusters for a higher number of front seats, as compared to rear seats. Based on vehicle, the global automotive seat belt height adjuster market has been classified into passenger vehicle and commercial vehicle. In terms of vehicle, the passenger vehicle segment accounts for a remarkable share of the market, due to higher production of passenger cars. Furthermore, higher penetration of seat belt height adjusters in the passenger vehicle segment, especially in SUVs, owing to a surge in demand across the globe due to new flock of SUV models that influence consumers to switch to SUVs from traditional hatchbacks and sedans, is attributed to the high market share held by the passenger vehicle segment. In terms of region, the global automotive seat belt height adjuster market has been segregated into North America, Europe, Asia Pacific, Middle East & Africa, and Latin America. Among regions, Asia Pacific leads the global automotive seat belt height adjuster market. This is primarily attributed to the increase in vehicle production in China, Japan, India, and South Korea. The region is projected to maintain its dominant position in the global market during the forecast period. 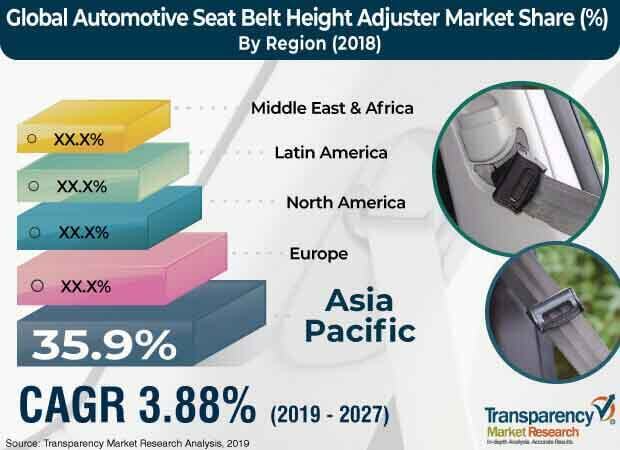 Moreover, entry of premium auto manufacturers in the region coupled with higher foreign investment and surge in number of manufacturing sites are likely to augment the automotive seat belt height adjuster market during the forecast period. Major players operating in the global automotive seat belt height adjuster market include APV Safety Products, IMMI, Autoliv Inc., Beam's Seatbelts, BERGER GROUP, Far Europe Inc., Goradia Industries, GWR Co., Joyson Safety Systems, IMMI, Robert Bosch GmbH, Seatbelt Solutions LLC, Saikai Vehicle Industry Co.,Ltd., and ZF Friedrichshafen AG. This report analyzes and forecasts the market for automotive seat belt height adjuster at the global and regional level. The market has been forecast based on value (US$ Mn) and volume (million units) from 2019 to 2027. The study includes drivers and restraints of the global automotive seat belt height adjuster market. It also covers the impact of these drivers and restraints on the demand for automotive seat belt height adjuster during the forecast period. The report also highlights opportunities in the automotive seat belt height adjuster market at the global and regional level. The report comprises a detailed price trend analysis, government regulatory scenarios, value chain analysis, which provides a comprehensive view of the global automotive seat belt height adjuster market. The Porter’s Five Forces model for the automotive seat belt height adjuster market has also been included to help understand the competitive landscape in the market. The study encompasses market attractiveness analysis, wherein end-users are benchmarked based on their market size, growth rate, and general attractiveness. The study provides a decisive view of the global automotive seat belt height adjuster market for vehicles, by segmenting it in terms of technology, seat, vehicle, and region. These segments have been analyzed based on present and future trends. Regional segmentation includes the current and forecast demand for automotive seat belt height adjuster in North America, Europe, Asia Pacific, Latin America, and Middle East & Africa. The report also covers demand for individual seat belt height adjuster segments in all the regions. The study includes company profiles of major players operating in the global market. Key players operating in the global automotive seat belt height adjuster market include APV Safety Products, IMMI, Autoliv Inc., Beam's Seatbelts, BERGER GROUP, Far Europe Inc., Goradia Industries, GWR Co., Joyson Safety Systems, IMMI, Robert Bosch GmbH, Seatbelt Solutions LLC, Saikai Vehicle Industry Co.,Ltd., and ZF Friedrichshafen AG. Market players have been profiled in terms of attributes such as competitive landscape, manufacturing footprint, company overview, financial overview, business strategies, and recent developments. The market for automotive seat belt height adjuster is primarily driven by the rising demand for safety and comfort while driving. The report provides the market size for 2018 and forecast for the next nine years. The global market size of automotive seat belt height adjuster has been provided in terms of value and volume. Market numbers have been estimated based on key technology, seat, vehicle, and regional segments of the automotive seat belt height adjuster market. Market size and forecast for each major seat belt height adjuster type and vehicle have been provided in terms of global and regional/country markets.